Every day we hear in the news that there is a crisis of raised obesity levels throughout the nation as more and more people consume unhealthy foods and severely slack when it comes to exercise. Although for some people it is more noticeable that they are over weight and unhealthy, many of us assume that our slim waste lines is a sign that we are in good health. However, although you may not be carrying the excess body weight it is important to measure other aspects of your health to give yourself that ease of mind. Before this would usually mean visiting your local GP to get a ‘check over’ or purchasing many tools to help measure such effects. 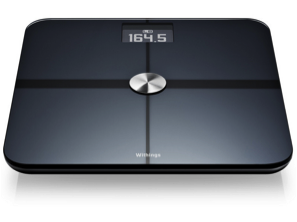 This is where Withings comes into play with their Smart Body Analyzer the world’s first smart scale. Looking like a standard scale, the Smart Body Analyzer has the ability to measure body mass index (BMI), body fat percentage, heart rate and recognise the individual users. The scale can then send information directly to your smartphone allowing you to keep track of your important health statistics via both Bluetooth and Wi-Fi. The scale is intended to be kept in the users bedroom where it works whilst the user is not there. This is one of Withings key selling points of the product, as the scale monitors CO2 levels in the air and notifies you of that figure gifting the user information that can help them sleep and overall improve their health. The Smart Body Analyzer, which was showcased at Mobile World Congress last week, is now available on Android and iOS and is currently retailing at $149.95, not a huge price to pay for a healthier life style.